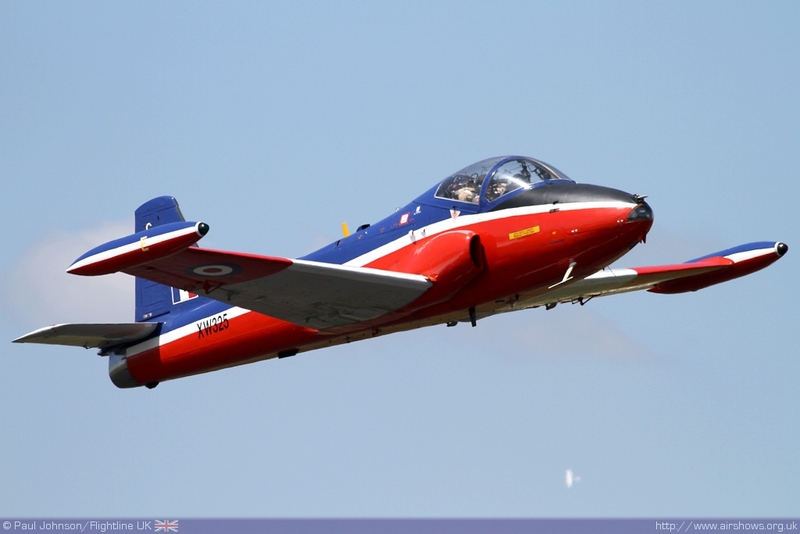 This year Kemble hosted the first big civilian airshow of the year - The Cotswold Airshow. 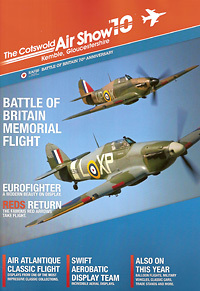 The rebranding reflects the rebranding of the airfield as Cotswold Airport which is a very active airfield with aircraft recycling, preservation and training businesses on the site. 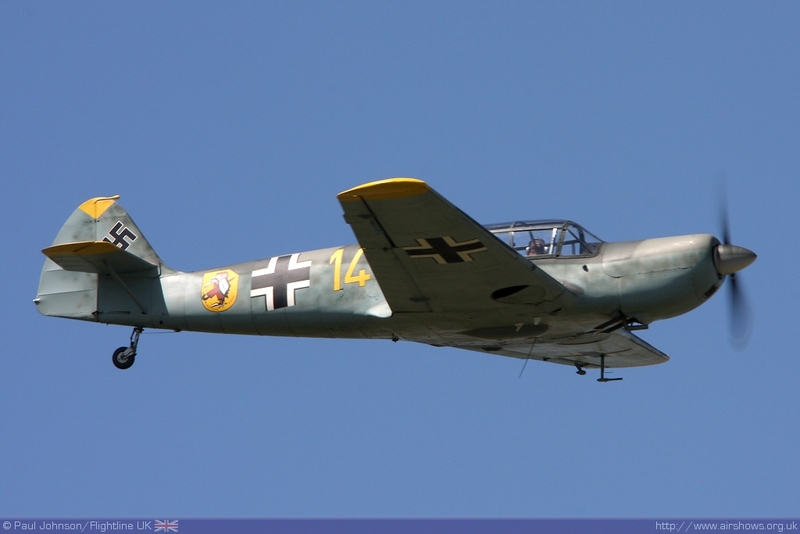 2010 was the second edition of the show in its new two day format and like many shows celebrated the 70th Anniversary of the Battle of Britain as its main theme alongside the usual mix of modern and historic jets as well as civilian display teams. 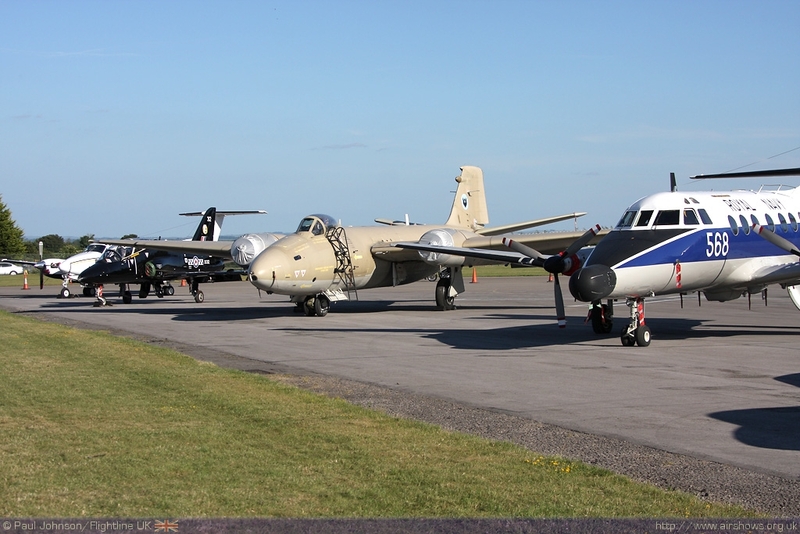 Paul Johnson/Flightline UK reports from a very warm second day at Kemble. 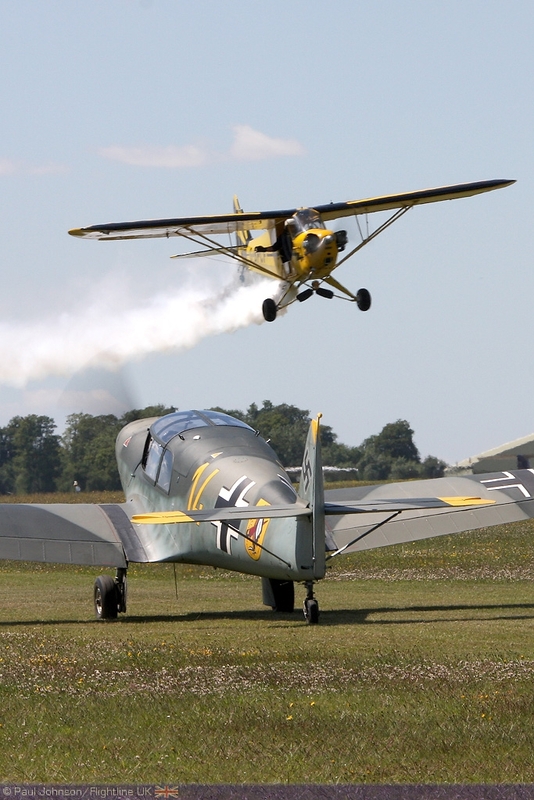 All photography copyright of the Author. .
Events at the Cotswold Airport have prospered. 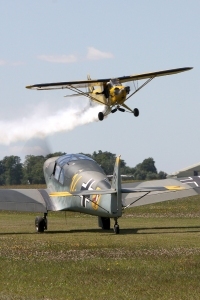 There are now three annual "air shows" at Kemble with the Great Vintage Flying Weekend in May as well as the Battle of Britain Airshow in September both of which are held on the north side of the airfield. 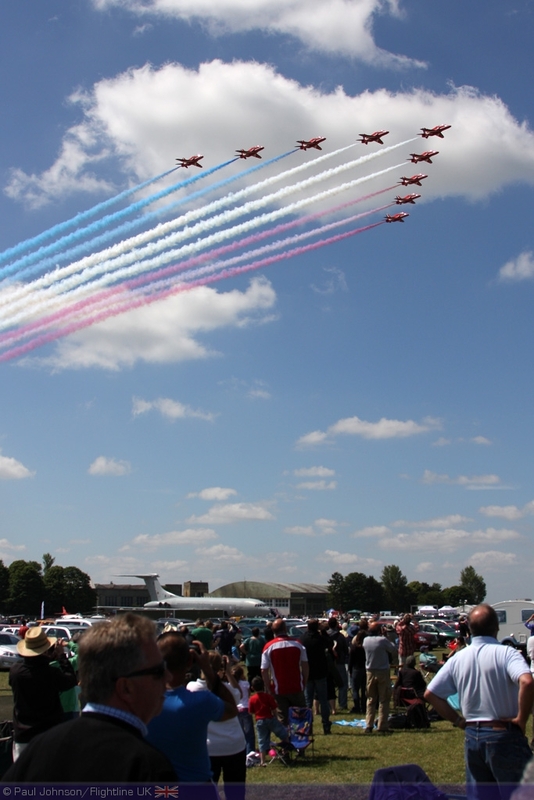 However, the Cotswold Airshow is by far the bigger event and is held on the South side of the airfield allowing for a much larger showground as well as greater access to the display aircraft for the general public. 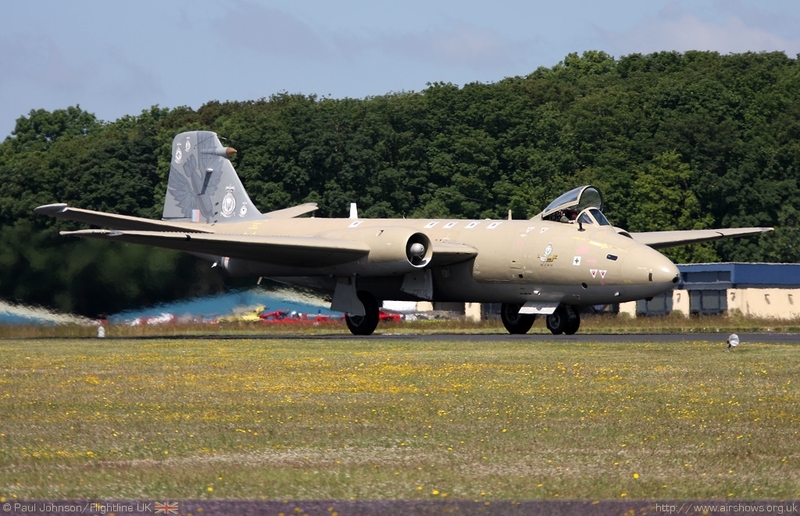 The showground was dominated by one of the RAF locals, the VC-10 from nearby RAF Brize Norton. 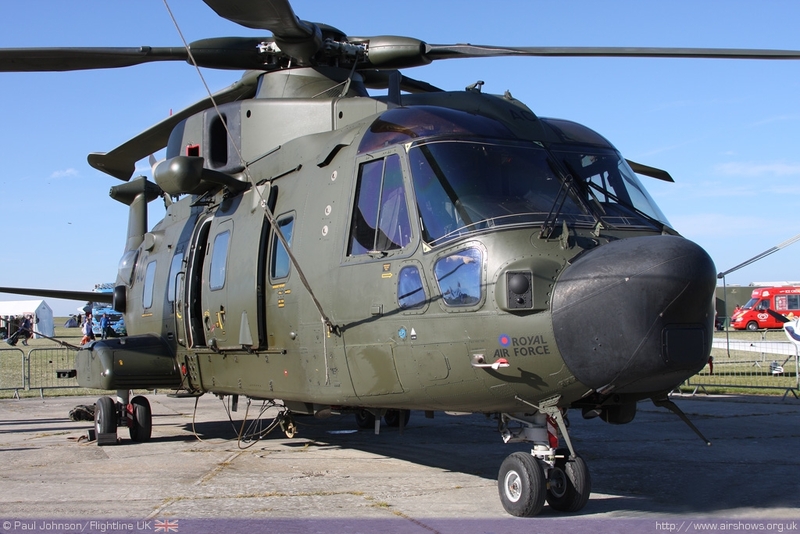 Alongside it were the Merlin HC3A from RAF Benson, a Tutor T1, Royal Navy Jetstream T2 as well as a whole host of classic jets and other types. There were other interesting exhibits from the armed forces as well as the Williams Formula 1 team! 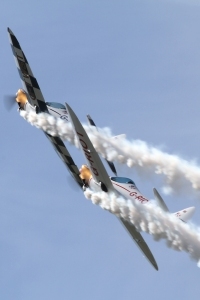 One of the traditions of the Kemble flying display is that the show is that the flying displays are split into two slots with the lunch break in-between. 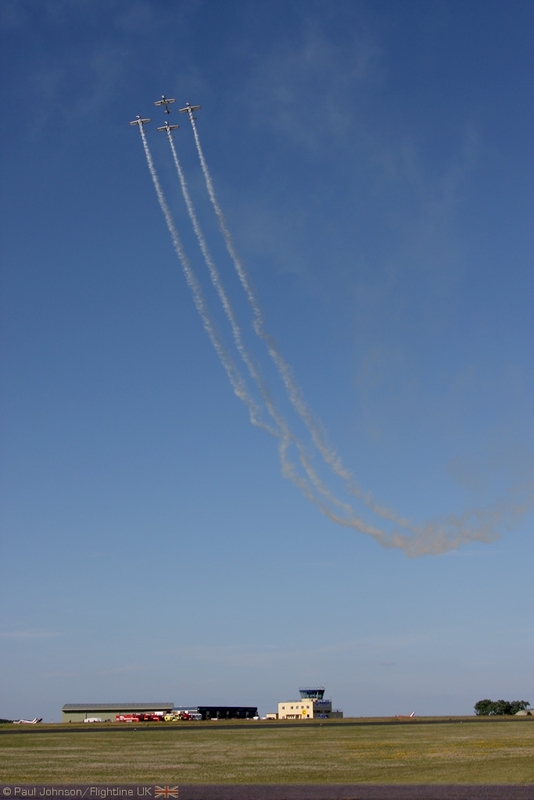 Opening the morning show on the Sunday were the Red Arrows performing their full display. 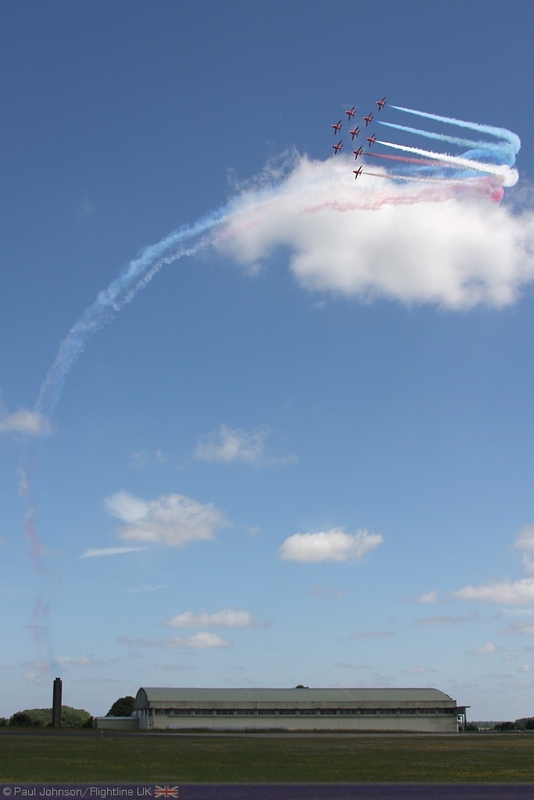 The Red Arrows are an important part of Kemble's history having been based here when the team was first formed. 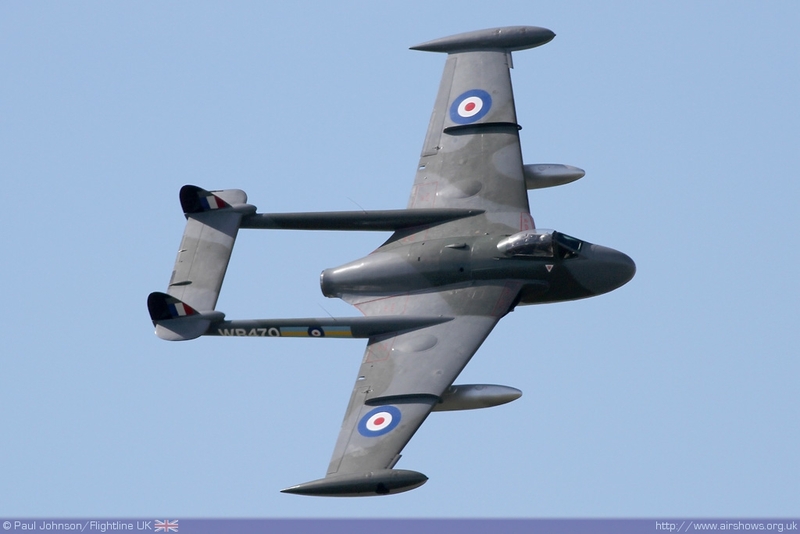 The Cotswold Airshow was part of the team's second weekend of public displays taking in appearances at both Kemble and Margate. 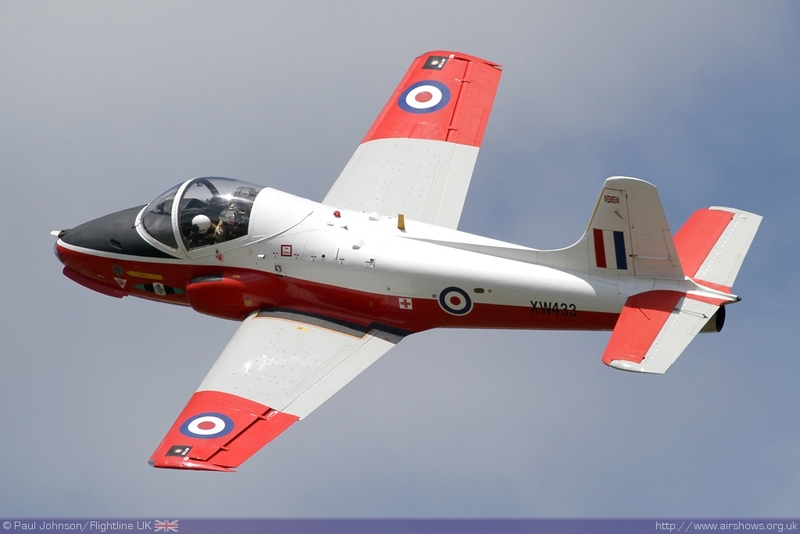 RAF participation at the Cotswold Airshow was a little down on previous years. 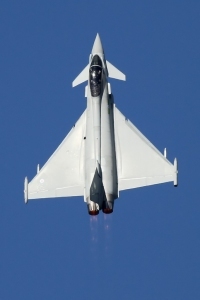 Planned appearances in the static park by a C-17 and a C-130J were cancelled due to operations while in the air, the only RAF solo displays were the Tucano T1 and the Typhoon FGR4. 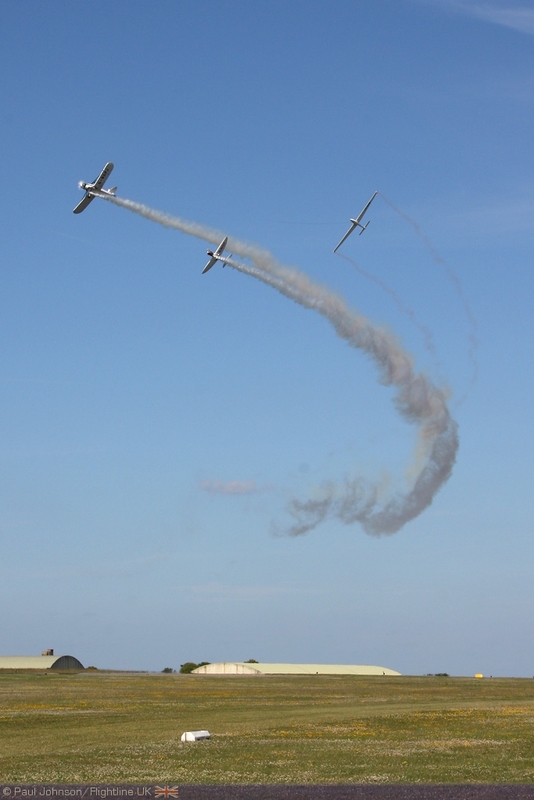 Like the Reds, both solo displays were kept busy attending displays at Margate and Silverstone on top of their commitments at Kemble. 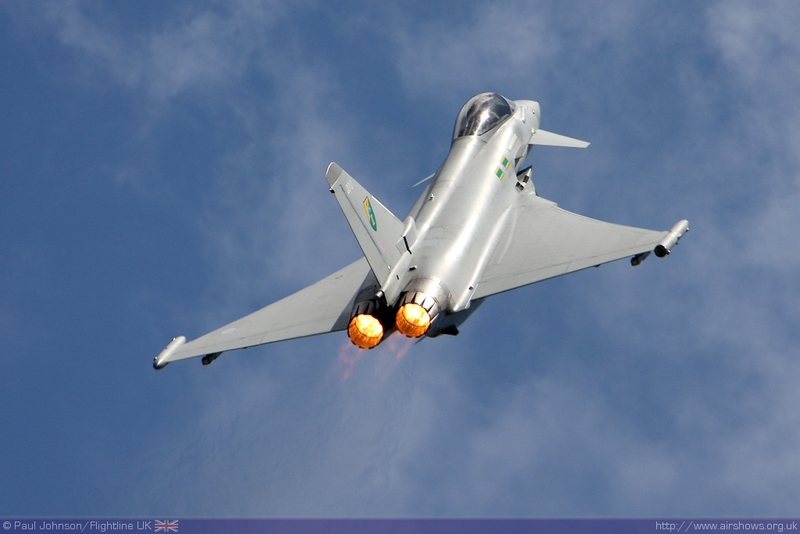 Also appearing during Saturday's flying programme was a Tristar from 216 squadron at RAF Brize Norton. 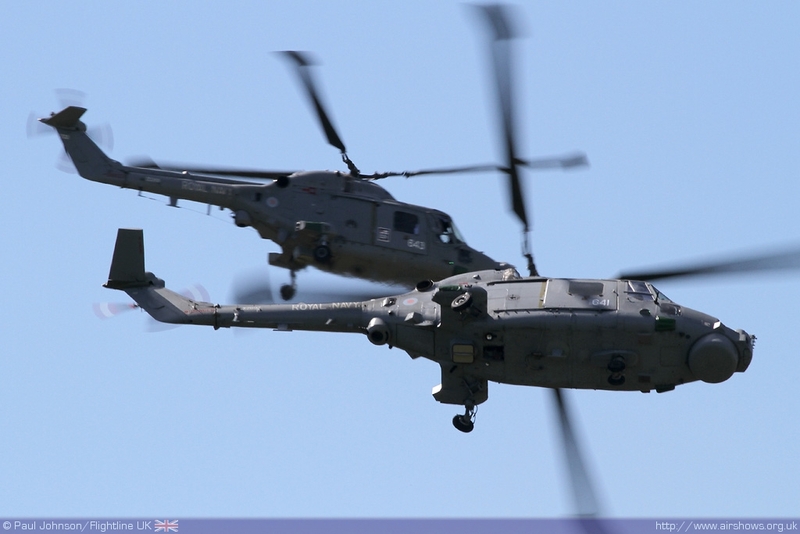 The Royal Navy also participated with the Black Cats helicopter display team. The Navy also had hoped the RN Historic Flight's Swordfish would be ready for Kemble buy alas it was not to be. 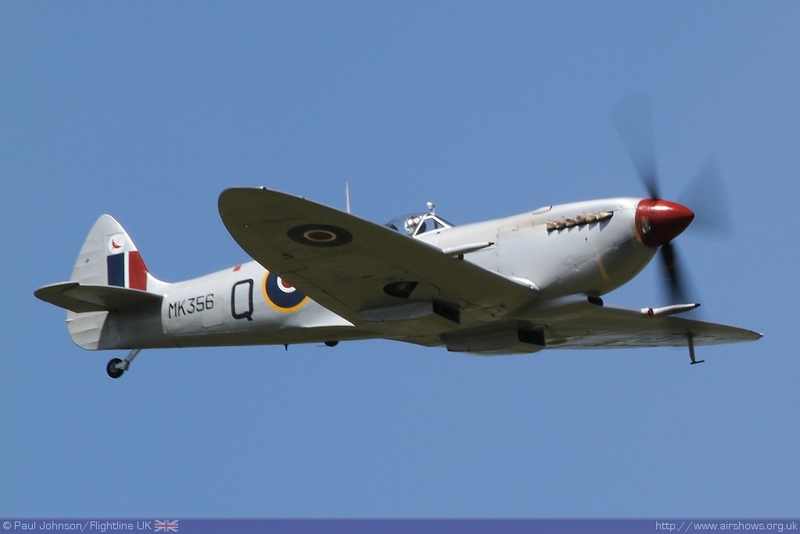 Its place was taken by Kennet Aviation's Seafire XVII flown by Dave MacKay. Star of the civilian line up for me was the return of Brendan O'Brien's Flying Circus act. 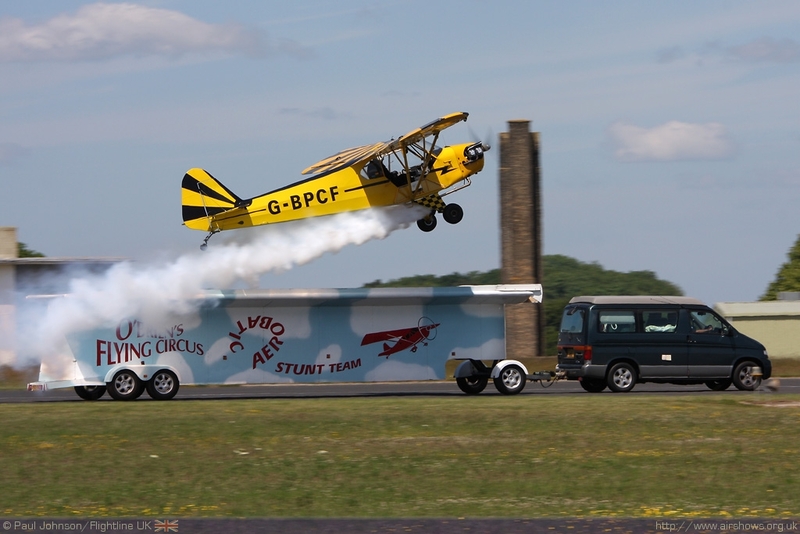 Brendan flies a clipped wing Piper J3 Cub which is fitted with s superb smoke system. 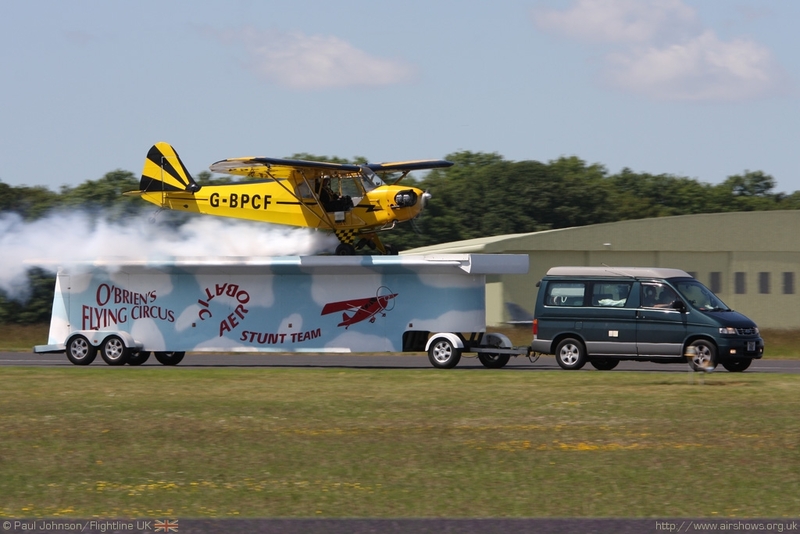 Brendan started his "circus" with a traditional crazy flying routine before moving on to "trailer landing." 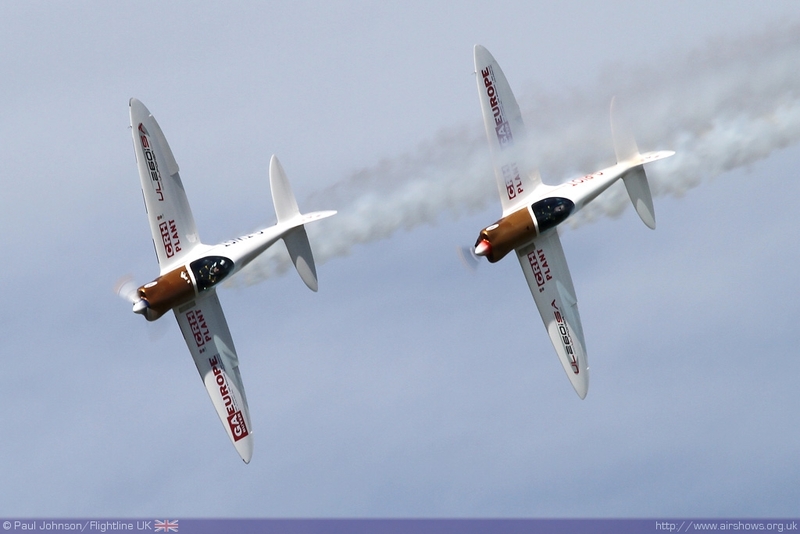 It's all immense fun and something the display circuit has been missing for a fair few years now. 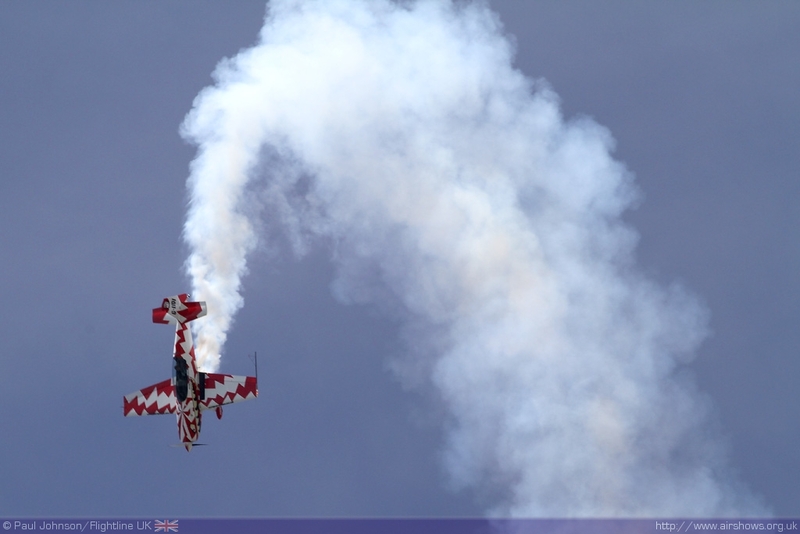 More colour and smoke came from one of the home team, Ultimate High's Extra 300L flown by Mark Greenfield. 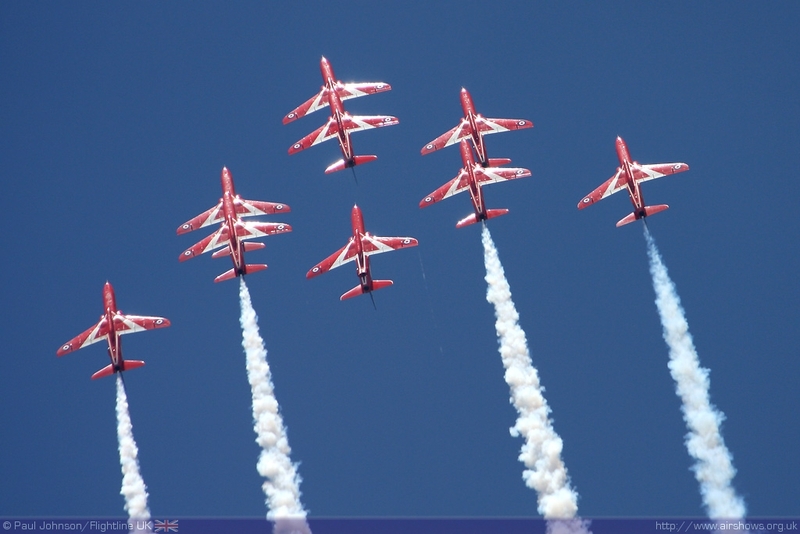 The splinter red and white colours really stand out from clear blue skies. 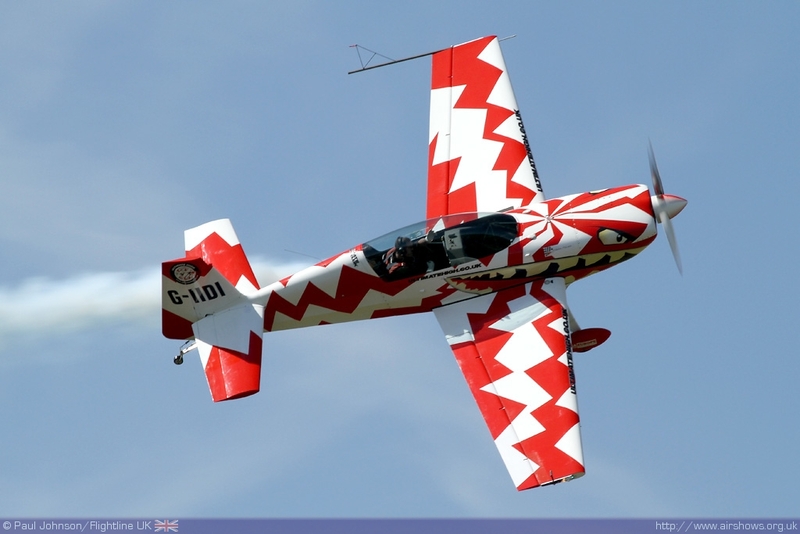 Further aerobatic prowess came from the Yakovlevs with their pretty aircraft and seamless display routine. 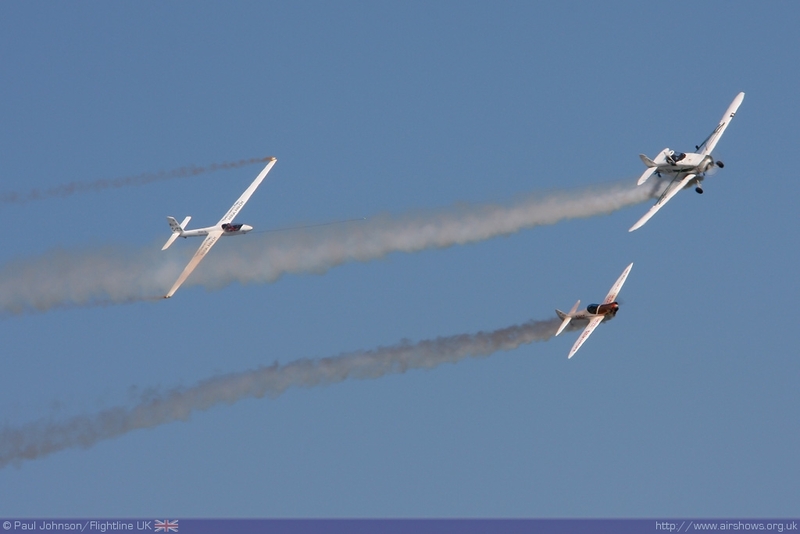 Completing the line up of civilian displays were the Twister Duo and the Swift Aerobatic Display Team. 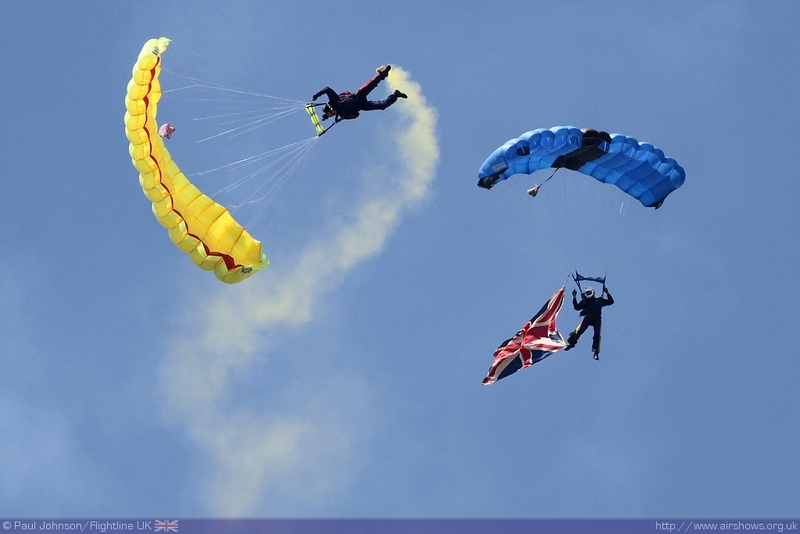 The teams arrived together for Saturday's display but were separated for Sunday's show. 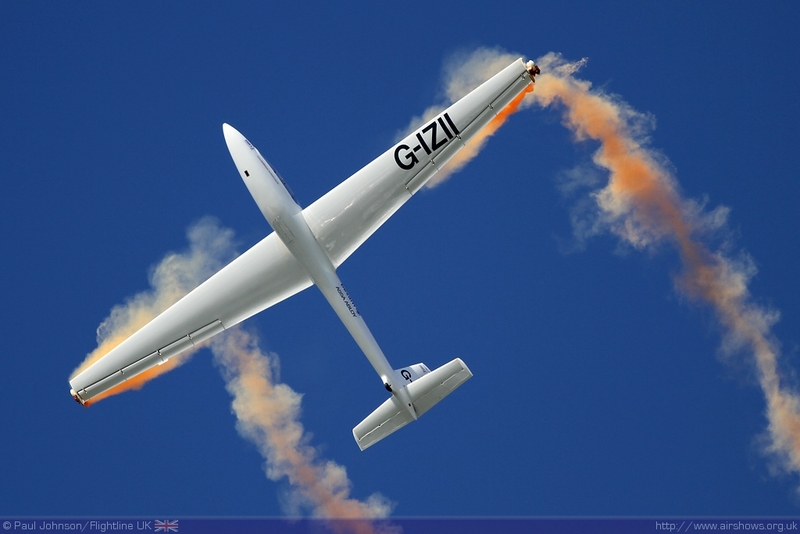 Saturday's glider pilot, Mike Newman, has recently won his third UK National Aerobatic Championship at unlimited level. 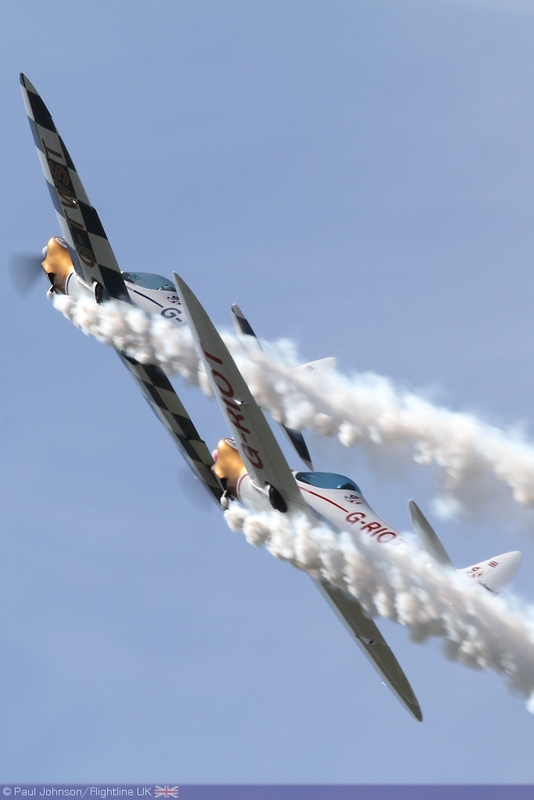 The Twister Duo have proved to be an excellent display item with their mix of formation and synchronised flying and they were a welcome late addition to the flying display. 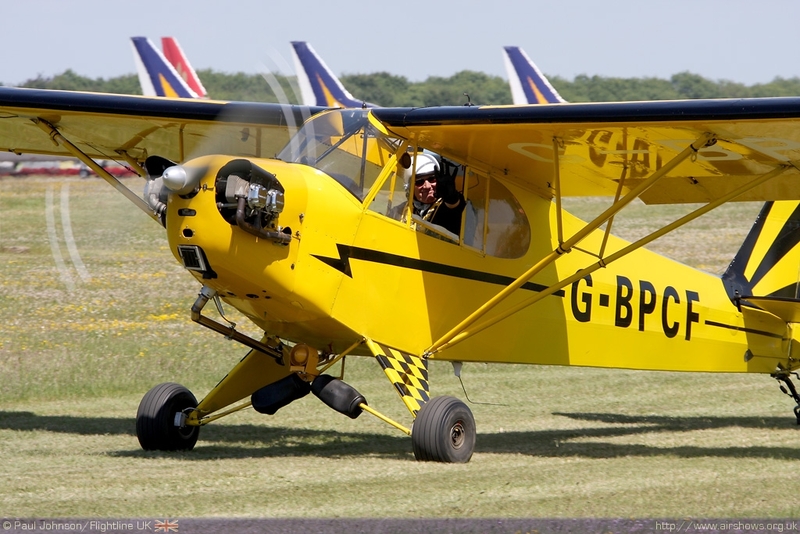 Completing the civilian line up at Kemble were a brand new parachute display team, The Renegades parachute display team from nearby South Cerney who put on an interesting display jumping from an An-2 on Saturday and a rare Shorts Skyvan on the Sunday. 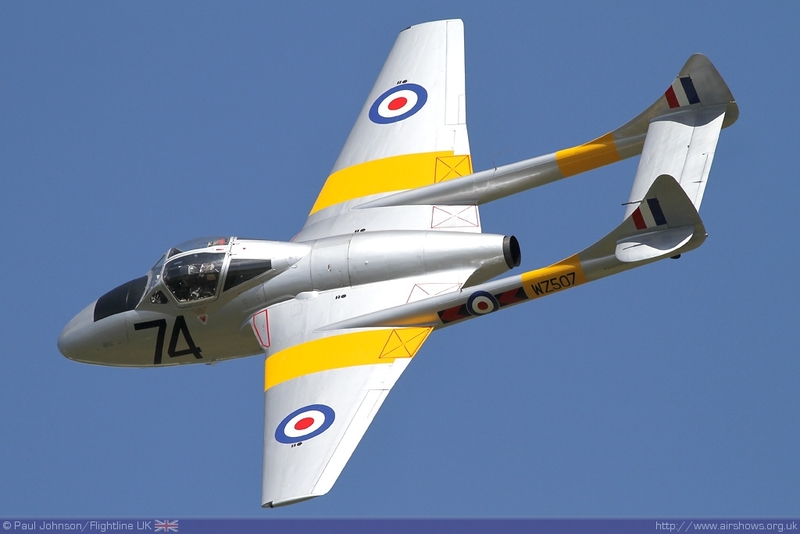 An airshow at Kemble would not be the same without a collection of classic jets. 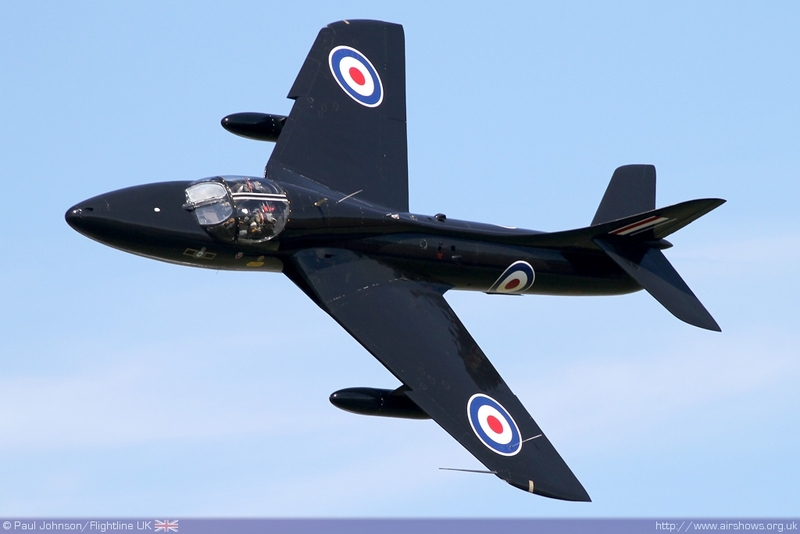 The only member of the home team to display was Delta Jet's all black Hawker Hunter T7A flown by Andy Cubin. 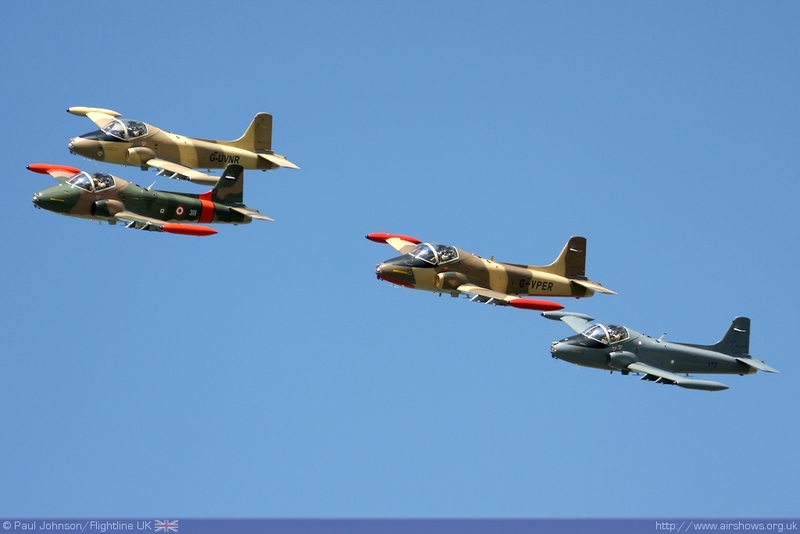 The Hunter was joined in the flying display by a collection of BAC Jet Provosts including three T5s and a T3A. 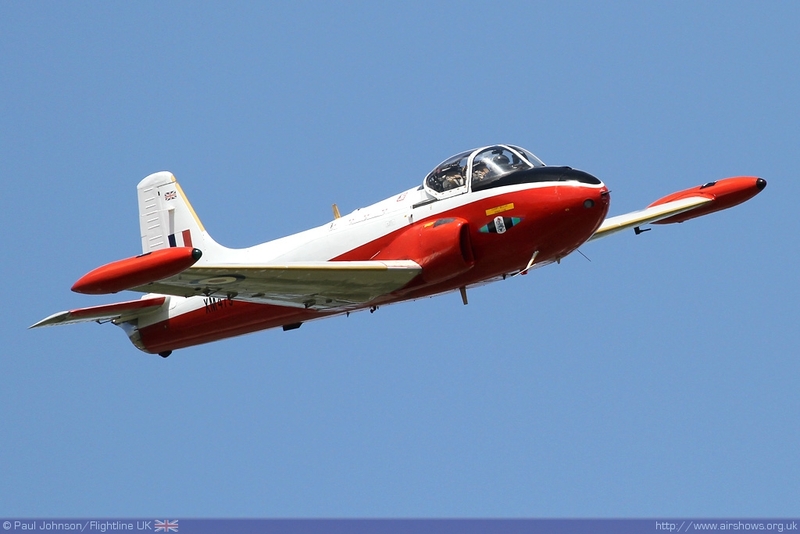 More Provost derivatives were displayed by Team Viper with their Strikemasters who were back up to a full four ship at Kemble. 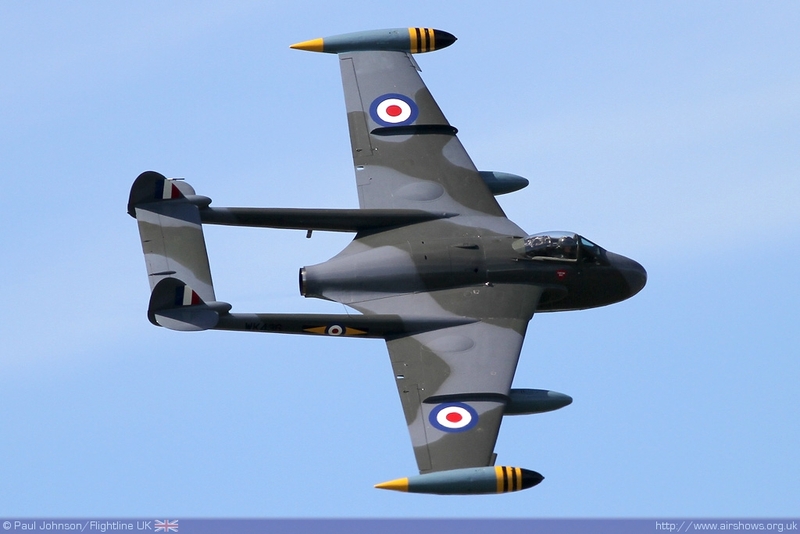 However, the shining lights amongst the collection of classic jets were the Classic Flight's pair of De Havilland Venoms which put on a beautiful routine. 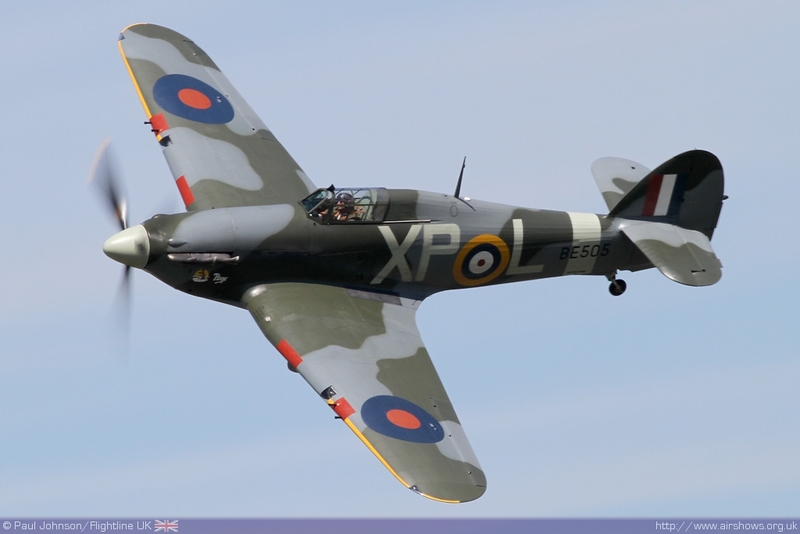 However, the principle theme of the Cotswold Airshow was the 70th Anniversary of the Battle of Britain which meant the displays featured more warbirds than usual. 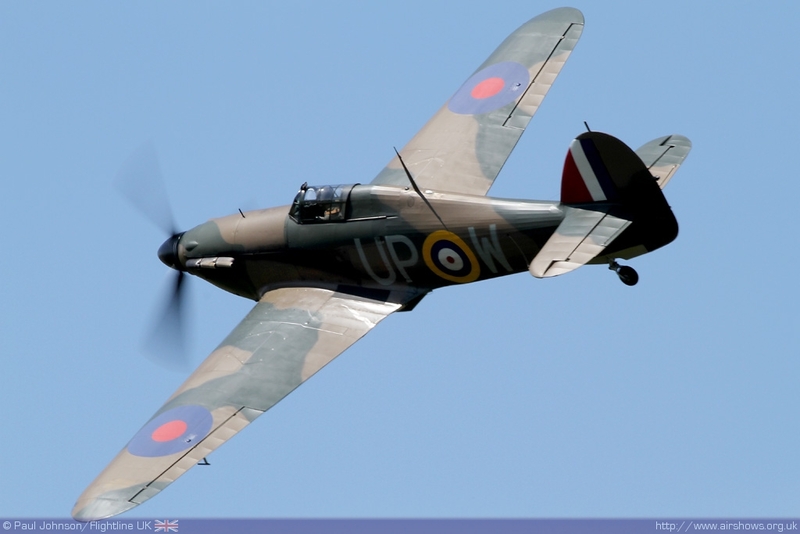 The Battle of Britain Memorial Flight was due to send their Dakota, Spitfire and Hurricane. 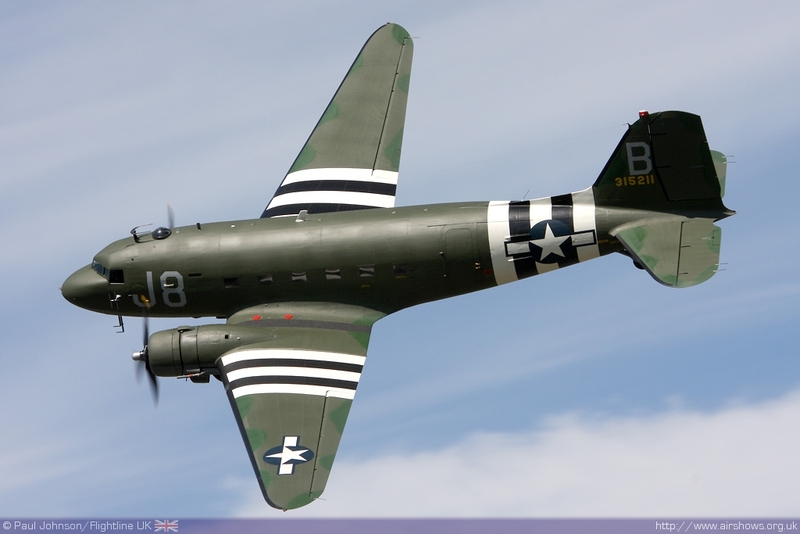 In the end, just the Dakota displayed though there flights Spitfire IX did arrive before going unserviceable. 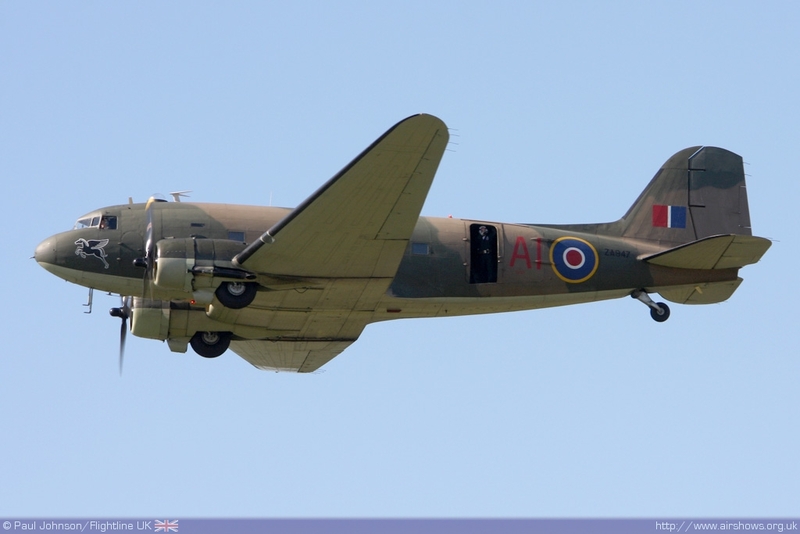 One of Kemble's newest operates, Wings Venture, also displayed their C-47 Dakota which saw service during the Second World War in support of Operation market Garden. 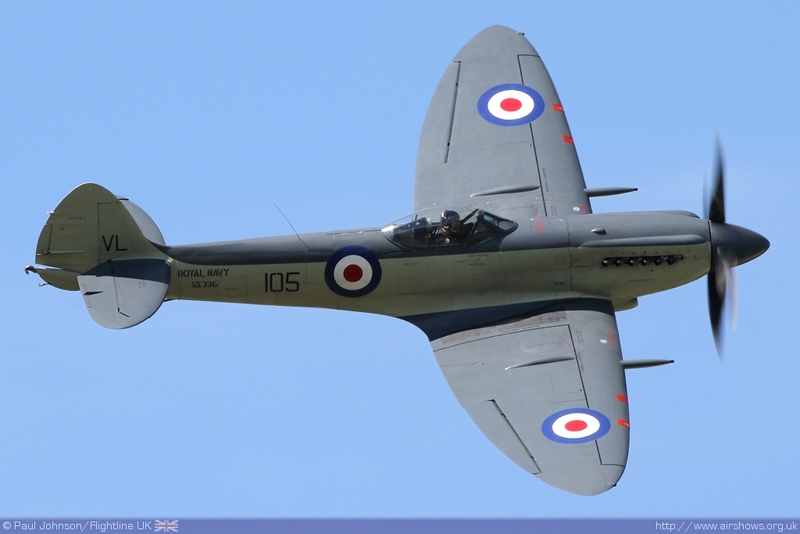 Wings Venture also had their newly acquired Supermarine Spitfire Ia in the display flown by Jonathon Whalley and Phil O'Dell. 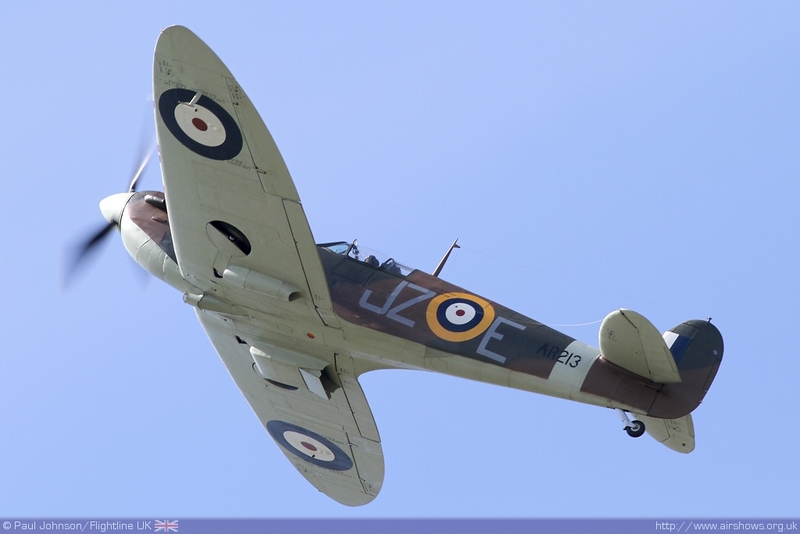 Though not a veteran of the Battle, this aircraft is representative of the versions of the Spitfire that fought during 1940. 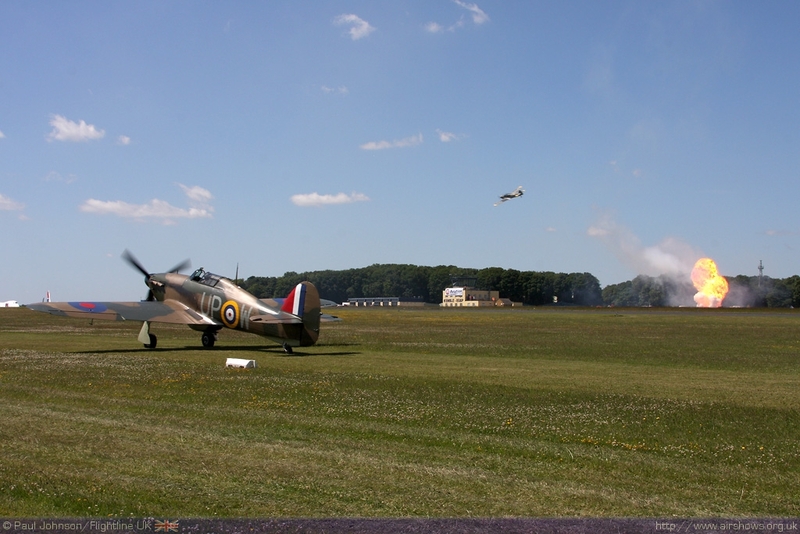 The centrepiece of the flying display was a Battle of Britain scenario involving Air Atlantique Classic Flight's De Havilland Dragon Rapide, the 108 Group's Messerschmitt Me108 Taifun and a pair of Hawker Hurricanes from Peter Vacher and Peter Teichman and supported by pyrotechnics. 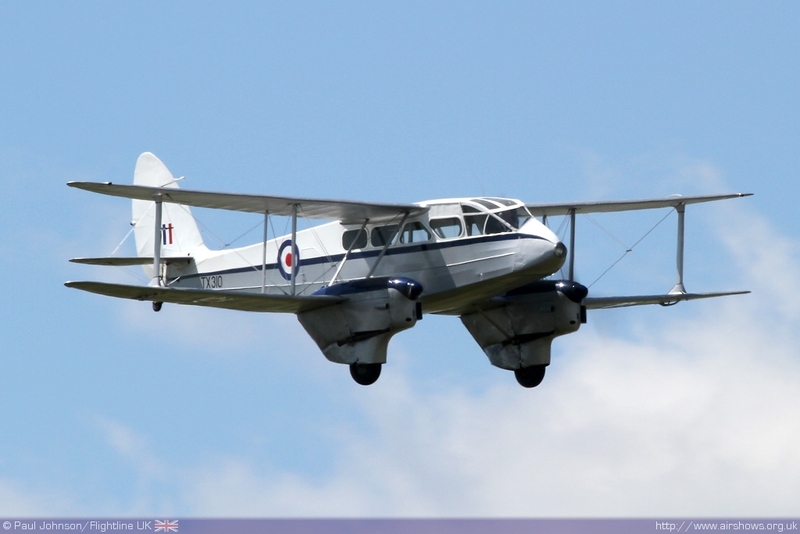 During the Battle, Kemble was home to No 4 Service Ferry Pool which delivered all manner of aircraft including Dragon Rapides (known as a Dominie in RAF service) as well as more potent types. 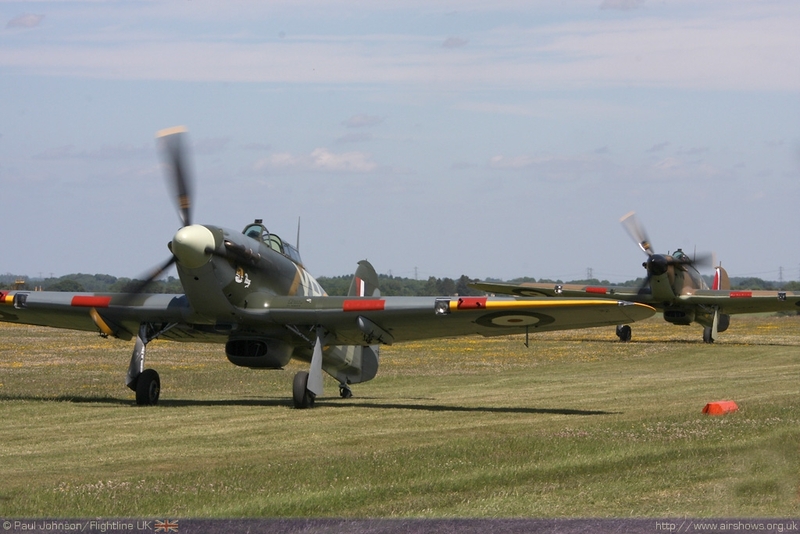 Perhaps Kemble's most famous story during the Battle of the engagement of a KG51 Ju88 by Pilot officers Bird and Manlove flying a pair of Hurricanes. 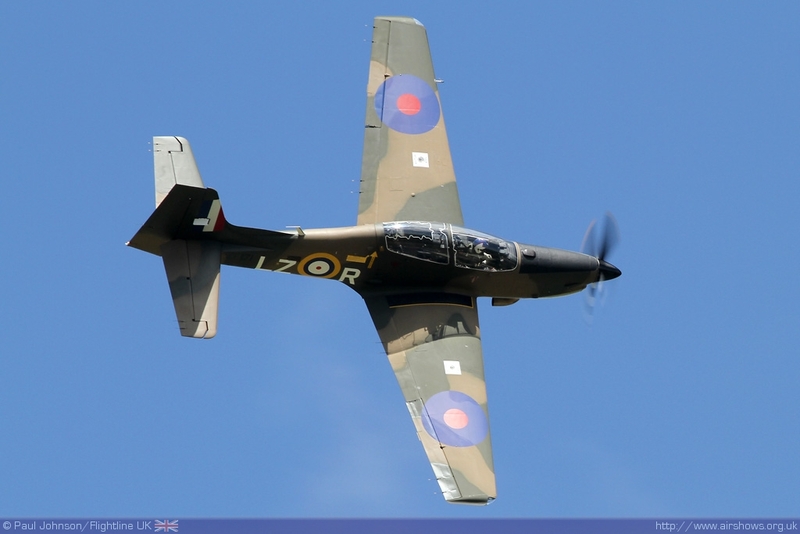 Bird ended up either purposely ramming or colliding with the raider and was killed while Manlove eventually brought down the aircraft near Stroud. The volunteer team at Kemble put a superbly well organised event which was blessed with some kind weather that made for an excellent day out. Despite a relative lack of classic jet and RAF participation, the flying display was competent and entertaining, but didn't really live up to the standards set by previous displays at Kemble which has often provided some of the most memorable moments during the airshow season.